This week it’s Julie Hyde who took part in The Chilly 10K with us last year. “Our amazing little boy Freddie was born in May 2011 and as far as we were aware he was perfectly healthy. 6 weeks later a heart murmur was found and when he was 4 months old he was diagnosed with a life threatening congenital heart condition called “tetralogy of fallot”. Our lives fell apart at this point but thanks to the amazing doctors, surgeons and nurses at Bristol Children’s Hospital Freddie has now had 2 open heart surgeries and is leading a normal life. He is still monitored regularly and could need surgery later on in life but at the moment he is fit and well. 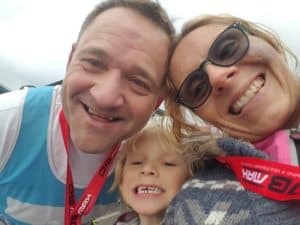 As a way of saying thank you my husband and I began to participate in different sporting challenges to raise money for the amazing Grand Appeal Charity. For myself it was running races and my husband multi sport challenges like duathlons and triathlons.